Any food grown with the help of industrial solvents, irradiation, or genetic engineering is not considered organic. Conventional farming can also introduce man-made pesticides into food, soil, water, and the air. Meanwhile, the production of artificial fertilizers is damaging to our natural surroundings, involving fossil fuels and degrading soil and ocean dead zones. These practices impact our bodies, wildlife, and the overall environment negatively. Clearly there are many benefits to eating organic, but these benefits come at a price. Organic food sold at the grocery store can be very expensive. Thankfully, it isn’t the only option. The most economic and convenient way to eat organic, natural, and earth-friendly food is to grow it yourself! The following tips will help you get your organic garden going. 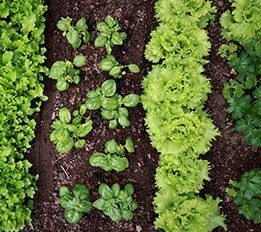 Synthetic fertilizers can be harmful to your garden because they affect not only your food, but the beneficial bacteria, worms and other microbes living in your soil as well. Gardening organically means avoiding these fertilizers—but that doesn’t mean that your fruits and veggies have to be starved of nutrients. Assess your garden’s needs by getting your soil tested. It’s best to apply organic nutrients to gardens before winter, so test your soil in the fall. To do this yourself, purchase a home testing kit. You can also consult the experts by sending a soil sample to the local agricultural extension office. Let them know that your garden is organic, and you will receive not only thorough data regarding your soil’s pH and nutrient levels, but appropriate treatment solutions as well. Whether or not you take the time to test your soil, it’s always good to incorporate humus, meaning organic matter, into your garden. Options include compost, leaf and grass clippings and manure. If you’re interested in planting seedlings and want to garden organically, look for naturally-grown specimens when browsing for plants. This way, you can make sure that your plants were raised without applications of chemical fertilizers and pesticides before they made their way to your garden. Population growth and climate change have made water a more precious commodity than ever. Garden responsibly and effectively by quenching plants’ thirst without going overboard by overwatering. Mature plants should be watered substantially, but infrequently. They need one inch of water per week including rain, which can be collected to conserve aquatic resources. Reduce weed growth and protect your soil by using organic mulch on your garden. Wood chips are more expensive to obtain than straw, but they also last longer. Grass clippings are another option, as long as they’re only applied to plants that require a lot of nutrients like squash and lettuce. When it comes to protecting your garden from pests, there are many alternatives to using harsh pesticides. First, make sure that your plants are as strong as possible by checking that they’re getting the correct amount of light, water, and nutrients. Diversify your garden as well, so that the most appetizing produce to a particular pest is limited and biodiversity is maximized. Encouraging natural predators to occupy your garden will also keep pests at bay. Leave out small amounts of water, grow plants with small blossoms, and set up nets and row covers to attract helpful creatures such as ladybugs, frogs, toads, lizards, birds, and even bats. You can also use organic substances to combat pests—try bacteria, horticultural oils, insecticidal soaps and garlic and hot pepper sprays.